The Celebration of Cultures will be held this Saturday and Sunday at Centennial Park in Nashville. In association with the Celebration, a Walk As One will take place at 9am Saturday (check-in at 8am near the park's plane and train), and the Schermerhorn Symphony Center will have an open house with free musical performances (Saturday only), including Serenatta and the MTSU Salsa Band. Free shuttles will run between Centennial Park and the Schermerhorn. Latin influence will abound, including the following demonstrations highlighted by this article in the Tennessean, "Cheekwood Botanical Garden & Museum of Art will have a project pertaining to the upcoming Latin American holiday El Dia de los Muertos ... American Roots Music Education will perform American traditional music such as ... Tejano, [and] ... Grow Nashville will demonstrate for children how to make salsa from organic vegetables." Centennial Park returns to its original roots with this event. The original Centennial Exposition on the site included "villages" from around the world, including a Cuban Village with Spanish Sen Sen Dancing Girls (see photo here and description here). You don’t have to travel the world for exotic food, music, and art. It’s all right here in Nashville at the 11th annual Celebration of Cultures Festival on October 6th and 7th in Centennial Park. Times are Saturday, 10 a.m. – 7 p.m., and Sunday, 12 p.m. – 5 p.m. 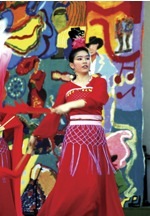 The event will feature over forty ethnic dance and musical performances on multiple stages. Entertainers like the San Rafael Band (Latin Jazz), African Drummers (Ghana), Chinese Culture Club (China), Cripple Creek Cloggers (USA), Gary Cady (Native American), Ketsana (Laos), Pega Kadivar (Azerbaijan), and much, much more. Enter “The Villages” and be transported around the world! New this year, The Villages offers an authentic look at the customs and traditions of Burundi, Ethiopia, Laos, the Philippines, and the Latin American countries of Bolivia, Brazil, El Salvador, Mexico, and Peru. As you walk through, you will hear traditional music in the background as the native language of each area is spoken, and you will see colorful clothing and decorations that are customary for each country. Original art and imported hand-crafted items will be available for purchase in “The World Market”. A special exhibit called “Nashville’s Internationals” will also be on display at the Centennial Art Center October 5-26, and will be featuring fifteen artists from around the world that now call Nashville home. Plus, a children’s area will include free interactive music and dance programs, storytelling, nature activities, and arts projects. Celebration of Cultures provides an opportunity for the community to gather, honor, and explore the diversities and ethnicities that make Nashville so unique and culturally enriched. Parking is free in Centennial Park and in the HCA parking lots off Park Plaza behind the park. Shuttles will run throughout the event to transport people to and from parking in Centennial and at HCA. Plus, Saturday, there will be free shuttles between Centennial Park and the Schermerhorn Symphony Center. Photo by Beth Kindig, courtesy of Celebration of Cultures.